In 2017 there were wildfires in California, Idaho, Washington, Montana, and Oregon – not to mention two major hurricanes in the Southeastern United States. Beyond impacting and displacing the lives of families, these disasters are having an ongoing impact on new and used car leads. Many of the cars in the areas affected by the disasters are being sold or scrapped, thus creating an influx in both the new and used car markets. As a result, it’s a crucial time to look at your new and used car leads in a new way because your new and used car leads could be community members looking to replace a vehicle damaged by a natural disaster. Fortunately, automakers are providing discounts for those affected by the wildfires and hurricanes. It’s creating a unique opportunity to reevaluate your used and new car leads and reach a new, unique customer: a person, possibly displaced, with an insurance claim payout looking to replace their damaged car. Keep in mind that many manufacturer natural disaster discounts are only several hundred dollars, which relatively speaking is not much of a discount. Nonetheless, $700 saved to a family trying to rebuild after a disaster is helpful. If you’re a part of the communities affected by recent natural disasters, be sure to filter your used and new car leads for people trying to rebuild their lives. These customers may be appreciative of a customized sales approach and being made aware of special automaker discounts. CarsDirect offers more than just the best new and used car leads, but also a full suite of products designed to help car dealers sell more cars: New Car Leads, Used Car Leads, Special Finance Leads, and innovative Display Advertising and Mobile solutions. We encourage you to explore this website to learn about how our award-winning products can help you move more units. To say that the automotive new car marketplace is constantly shifting is an understatement. Incentives pop in and out of existence, seemingly randomly and without notice. But nothing is revolutionizing new car sales as much as digitally originated sales. According to a research paper from Frost and Sullivan, 60-70 percent of new car leads will come from a digital platform by 2020. It can be tempting to disregard the idea of digitization affecting auto sales, but the reality is that no industry is immune from being affected by digitization (even the grocery industry!) – and 2020 is approaching quickly. As of February 2017, Frost and Sullivan estimates that 65% of car purchases start on a smart phone, and over 90% of buyers go online to perform research. By the year 2022, Frost and Sullivan estimates that over 70% of all new car leads will originate online. The paper also explores why digital leads are better in quality and easier to follow up on versus traditional new car leads. In the digital space, new car leads come from people who are at least in the investigative phase of their car buying experience. This is why new car leads originating from the digital space should be a big priority for your dealership. If you’re not currently on track to ensure that 60-70% of your leads are digitally derived by 2020, consult a third-party auto lead generation provider for new car leads like CarsDirect. CarsDirect offers a full suite of products designed to help car dealers sell more cars: New Car Leads, Used Car Leads, Special Finance Leads, and innovative Display Advertising and Mobile solutions. We encourage you to explore this website to learn about how our award-winning products can help you move more units. Getting serious about third-party auto lead generation is worth the effort. In fact, using third-party auto lead generation resources can often be the difference between meeting monthly goals and missing them. Old-school techniques like cold calling are tried and true for a reason, but they work only as part of a bigger-picture sales strategy. Even new-school techniques like engaging with car buyers on social media are just a part of running a successful dealership. Cold calling works – it has historically, and it’s still an effective tool today. Snail mail newsletters work by calling attention to inventory. Social media is an amazing tool to connect with and build relationships with customers. Even having your store’s entire website re-designed around driving auto lead generation can be beneficial for the bottom line. Yet, while being totally self-reliant on in-house auto lead generation seems good in theory, you’re still missing out on sales. 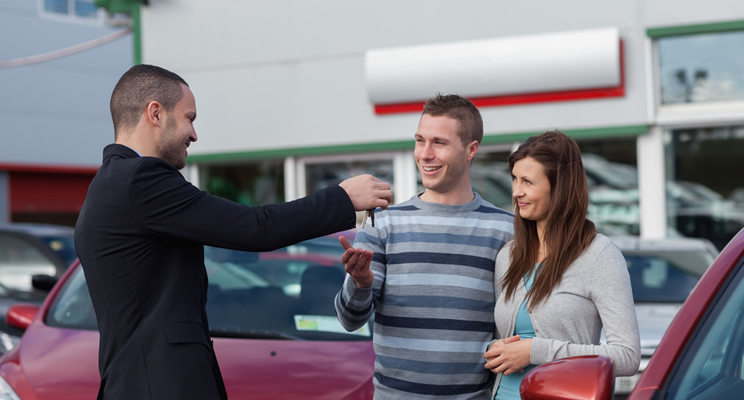 Different buyers have different needs and methods when buying cars. Many are distrustful of dealerships, and therefore of auto dealership websites. Others don’t enjoy the traditional car buying experiences. Some enjoy the comfort of car shopping from home. Many younger buyers don’t realize that cars must be obtained from franchise dealers and not from the OEM directly, so they don’t think to search for websites at the dealership level. To serve this vast audience of car shoppers that isn’t landing on auto dealer websites, there are third-party auto lead generation websites like CarsDirect. These sites assist car shoppers by augmenting the traditional car buying experience while still connecting them with your inventory. Have you heard the news? CarsDirect and Auto Credit Express have joined forces to create North America’s largest subprime automotive solution provider! Both brands will continue to operate separately, while benefiting from shared resources and technology. Combined, we now serve more than 2,000 dealers across the United States and are processing 250,000 credit applications each month — a 40% increase. And we have exciting product innovations in the pipeline. All of this means that you’ll will benefit from more opportunities to sell than ever before. Even better, we’re thrilled that CarsDirect and Auto Credit Express were each the recipients of 2016 Dealers’ Choice Awards presented by Auto Dealer Today magazine. CarsDirect received the #1 Diamond Award for Best Special Finance Lead Provider. Meanwhile, Auto Credit Express was honored with a Gold Award in the Special Finance Lead Provider category. This makes CarsDirect a six-time Dealers’ Choice Awards winner in the Special Finance category. CarsDirect also received a Gold Award in the Used Car Lead Provider category. Of course, CarsDirect offers a full suite of products in addition to Special Finance — including New Car Leads, Used Car Leads, and innovative Display Advertising and Mobile solutions. We encourage you to explore this website to learn about how our award-winning products can help you move more units. We’re pleased to announce that CarsDirect has partnered with MSN to become the exclusive new vehicle quote provider on MSN Autos. As result, CarsDirect dealer partners now enjoy increased consumer visibility by gaining access to the millions of car shoppers who visit MSN Autos each year. 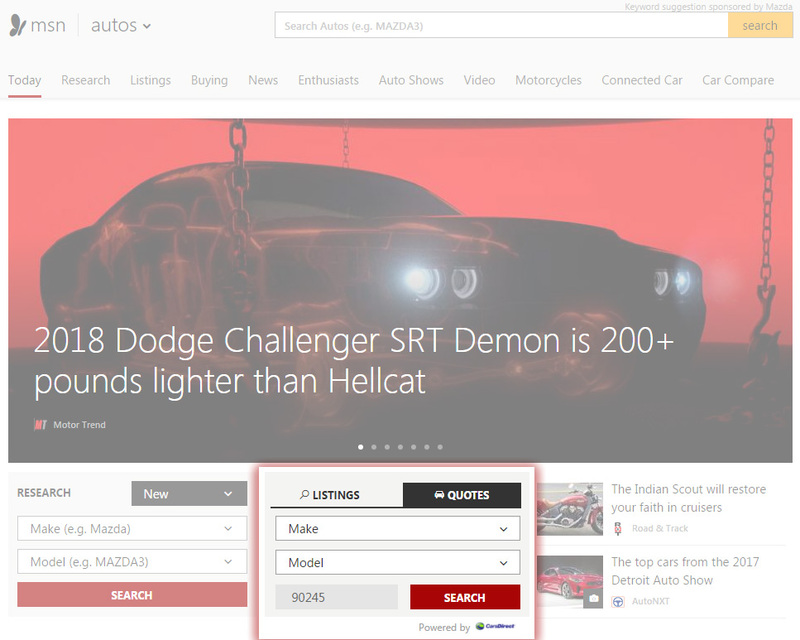 Consumers in the United States who visit the MSN Autos shopping portal have the option of submitting an inquiry for a price quote. With this new partnership in place, consumers are now directed to a pricing landing page powered by CarsDirect when they request a quote. On that page, consumers can submit information to receive instant pricing quotes from CarsDirect dealer partners. CarsDirect provides consumers live chat and telephone support throughout the entire pricing quote process to maximize engagement. Dealer partners benefit from CarsDirect’s award-winning lead verification systems and high conversion rates, with an average of 71% of leads converting to sales within 6 months. And if you’d like more information on exactly how you can take advantage of this new partnership to sell more cars, just fill out this form and we’ll get all your questions answered. To take your subprime sales success to the next level, it’s essential to stock the right inventory. We want to make sure your customer succeeds with a solid, affordable and reliable vehicle that will help them re-establish their credit. As such, it’s important to know the top vehicles being sold to subprime customers. By having the makes and models that work for these customers in stock, you’ll be ready to rock when they roll onto your lot. Additionally, it’s particularly important to know which vehicles are being sold to subprime buyers in your specific region. 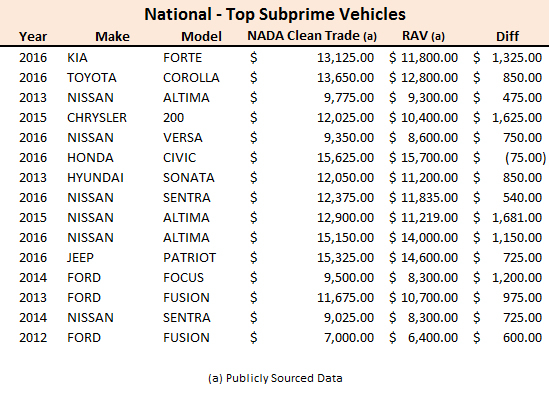 We know this because our data indicates that there are significant differences amongst the top subprime vehicles when both national and regional data sets are compared. Tailoring your subprime inventory to your region’s preferences will automatically give you a huge advantage. So if you’re looking to increase your subprime sales’, analyzing your inventory against what is selling in your area will give you the insight you need to make it happen. And to show you how to take this strategy to the next level, we’ve gathered data that shows which vehicles work best for both consumers and dealers. 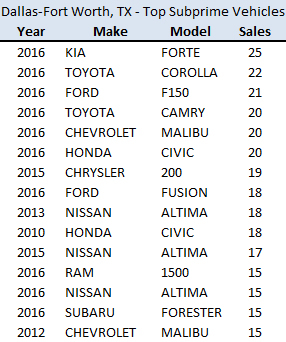 It’s interesting how the 2016 Kia Forte that tops the national list doesn’t even show up in the Phoenix data. 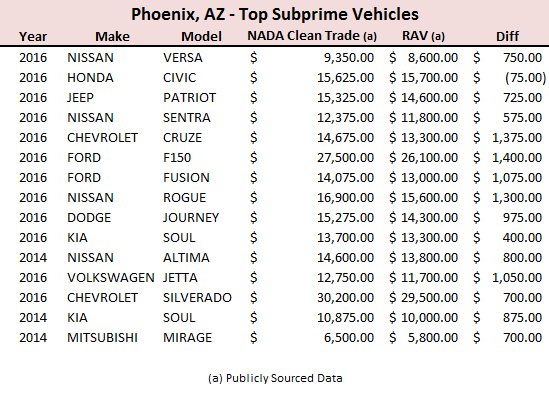 A lot of dealers see the Forte as the go-to subprime vehicle, but in Phoenix, AZ, the Nissan Versa is apparently the car to stock. Now that we’ve shown you how you can use region-specific data to boost subprime sales, let’s take it another step further and look at how this knowledge can help you increase profits. 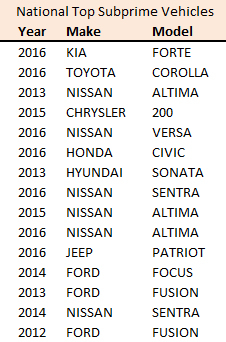 In the tables below, we’ve taken each of the top-selling subprime vehicles and cross-referenced them with recent auction value (RAV) data. We’ve included the NADA Clean Trade for each vehicle, the recent auction value and the difference between these numbers. 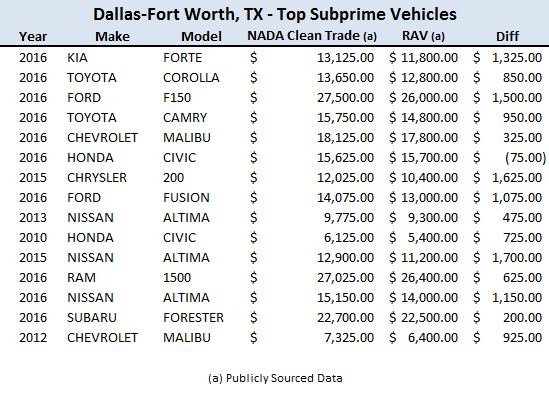 First, get hard data on which vehicles are being sold the most to subprime buyers in your region. 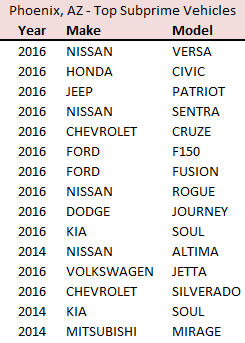 Next, book these vehicles and subtract their recent auction values from their NADA Fair Trade values to find out which makes and models make the most sense for your consumers. Finally, make sure these vehicles are solid, affordable and reliable so your customer will be successful in re-establishing their credit. Sounds like a pretty good game plan, doesn’t it? If you need region-specific information for your subprime department, we can provide valuable data. We also offer all of the additional tools and information you’ll need to support your subprime sales. The team at CarsDirect and Auto Credit Express understands the importance of finding the right lenders, maintaining the right inventory and using the right processes to get the job done. For a personalized market-analysis report for your dealership, fill out this form, or give us a call at 888-535-CARS (2277). All subprime lenders have specific parameters that ensure a fair selling price and the advance the dealer will receive on the vehicle you are selling. Therefore, the key factor in the entire lending process is accurately determining a vehicle’s value. 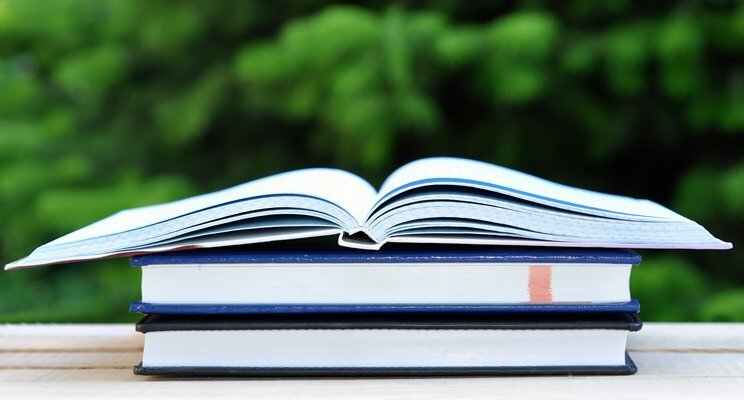 This value, as we all know, can be found in any one of the three recognized used car pricing guides: Kelley Blue Book, NADA Used Car Guides and Black Book. Some lenders accept values from any of these three used car guides, others use one guide. Do you book your inventory using all three guides? If so, are values all updated in a timely manner? If you don’t and they’re not, you’re probably leaving money on the table. Here’s how to avoid doing so. Let’s think this through. Consumer Portfolio Services (CPS), for instance, will consider any of the three used car guides. Does it matter? Let’s take a look at a specific example. One of your units is a 2013 Chevrolet Malibu LS with 35,000 miles – a nice reliable vehicle for subprime buyers. Its mileage is low enough for good terms and a value that will put a buyer into the $300 per month payment range. All figures are all based on clean book and adjusted for the mileage. You’ll notice there’s a $775 spread between the highest and lowest values. At a 115% advance, that’s a difference of $891.25. More importantly, that’s $891.25 in additional advance from the lender that would have been missed if your special finance department only had the time or resources to book it through NADA Used Car Guides. But here’s where it gets interesting. Both Kelley and Black Book values are updated weekly, while NADA Used Car Guides gets updated every month. Multiply those variables by the number of viable subprime units on the ground and you can see how the situation can get out of hand very quickly, leading to lost revenue or, more seriously, to bounced contracts. One way to eliminate these multiple issues is to use a subprime desking system like LotPro®. In this instance, your inventory is booked and updated simultaneously, using all three used car guides. Again using CPS as an example, LotPro’s integrated Deal Excelerator tool sweeps your entire inventory, giving you the book value that will result with the best deal structure. If you have a subprime department, or are in the process of building one, you’ll want to get connected to the biggest and best subprime lenders. After all, the more lending resources you have, the better your chances will be to get those subprime deals done. But how do you know that you’re connected with the best lenders? If you have been sticking to our list of top national subprime lenders and haven’t been working with smaller lenders, you probably haven’t been reaching your full potential. 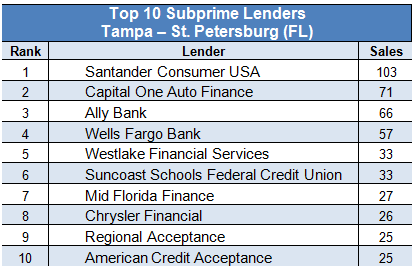 If you’re a subprime dealer in the Tampa area and you’re not working with any or all of the lenders listed above, you’re likely not reaching your subprime potential. 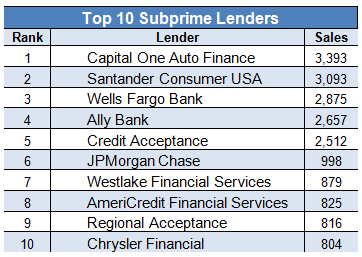 Knowing which subprime lenders have the highest rankings in your area is essential if you are trying to attract subprime traffic. The team at CarsDirect and Auto Credit Express can get you the most up-to-date lender rankings for your surrounding area. For a personalized market-analysis report for your dealership, reach out to us at 888-535-CARS (2277) today. We’d love the opportunity to share our insights to help you grow your subprime business.